Posts from this past week. 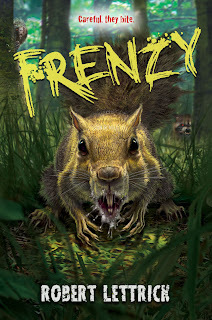 This week I want to share with you a few upcoming/ new released Zombie books that I'm excitedly looking forward to reading. As far as I know all of those not yet published are on track to release this year. All titles have been linked to Goodreads in case you'd like to check any of them out further. In no particular order, let's get to the books! 14-year-old Heath Lambert is spending his summer at Camp Harmony in the picturesque Cascade Mountain Valley. It's the perfect place to enjoy the soothing calm of nature as he weighs a heavy decision. The camp offers distractions: his friends, Cricket and Dunbar, always up for trouble; his reluctant crush on Emily, one half of the beautiful Em & Em Twins; and hulking bullies Thumper and Floaties, who are determined to make him their punching bag for the summer. But no one rattles Heath like his creepy cabin mate, Will Stringer. Brilliant, cold and calculating, Will views the world as one big chess game, and he's always three moves ahead of everyone else. Waiting On Wednesday is a weekly blog post hosted by Breaking The Spine where readers showcase which books they are highly anticipating. For this weeks Waiting on Wednesday, I chose The Fall by Bethany Griffin. The Diviners by Libba Bray Evie O’Neill has been exiled from her boring old hometown and shipped off to the bustling streets of New York City—and she is pos-i-tute-ly ecstatic. It’s 1926, and New York is filled with speakeasies, Ziegfeld girls, and rakish pickpockets. The only catch is that she has to live with her uncle Will and his unhealthy obsession with the occult. This week on From Page To Screen I'll be tackling the semi-controversial remake of Stephen King's Carrie. If you've followed my blog for awhile you'll remember me tacking the original Carrie in 2012 back when this was still called Book to Movie Monday. I'll link in Here in case anyone wants to take a look. First let's discuss the book Now for a little back story in case some of you aren't familiar with the novel. Carrie was written by the Author Stephen King and was released April 5,1974 by Doubleday. The Book is loosely based on Cinderella by The Brother's Grimm. Carrie was the fourth book written by Stephen King but oddly enough was his first book to actually be published. In it's initial printing the Hardback of Carrie only sold 13,000 copies but the paperback was a huge success selling over 1 million copies in it's 1st year. Jaap Sitters was only eight years old when his mother cut the yellow stars off his clothes and sent him, alone, on a fifteen-mile walk to hide with relatives. It was a terrifying night, one he would never forget. Before the end of the war, Jaap would hide in secret rooms and behind walls. He would suffer from hunger, sickness, and the looming threat of Nazi raids. But he would live. This time, there are no choices. Lucian “Lucky” Spark leads a double life. By day, he trains to become one of the Establishment elite. At night, he sabotages his oppressors from within, seeking to avenge the murder of his love, Digory Tycho, and rescue his imprisoned brother. But when he embarks on a risky plot to assassinate members of the Establishment hierarchy, Lucky is thrust into the war between the Establishment and the rebellion, where the lines between friend and foe are blurred beyond recognition. His only chance for survival lies in facing the secrets of the Sowing, a mystery rooted in the ashes of the apocalyptic past that threatens to destroy Lucky’s last hope for the future. Waiting On Wednesday is a weekly blog post hosted by Breaking The Spine where readers showcase which books they are highly anticipating. For this weeks Waiting on Wednesday, I chose The Rain by Virginia Bergin.